The garden is quiet, even though plants have been growing in the milder weather, as the photos show. However, winter has arrived in the UK and it’s best to sow nothing now, for at least a month. For example, a March sowing of tomatoes works fine, and is a lot less work than January sowing, followed by needing to look after plants in early spring when they often grow too big, before you can plant them. I am busy creating and writing an online course, available early March from this website. 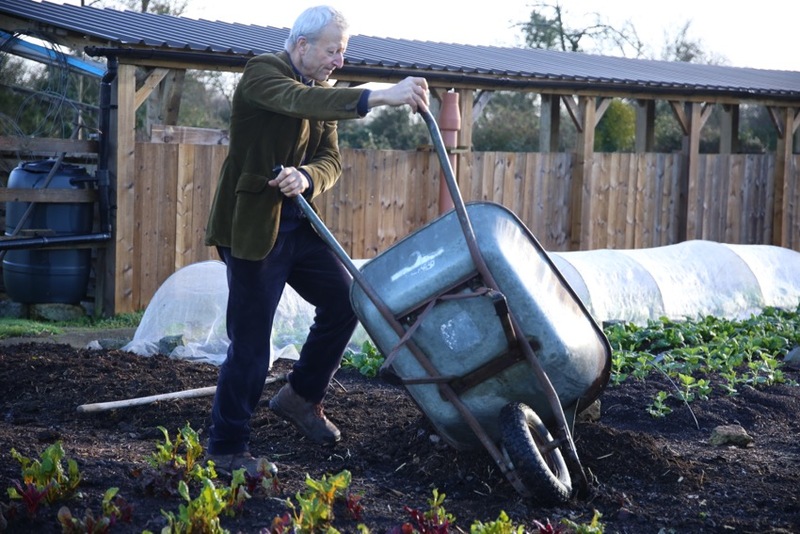 It has 20+ new videos, 600 photos and new descriptions all about no dig gardening, covering the angles I am so often asked to explain. It explains and shows you the beautiful straightforwardness of no dig. You can walk on beds, as I show in this recent video, filmed the morning after a long spell of rain. For another myth, see Mulching now below. I posted a lovely video on flowers at Homeacres too, memories of summer, filmed June 12th. 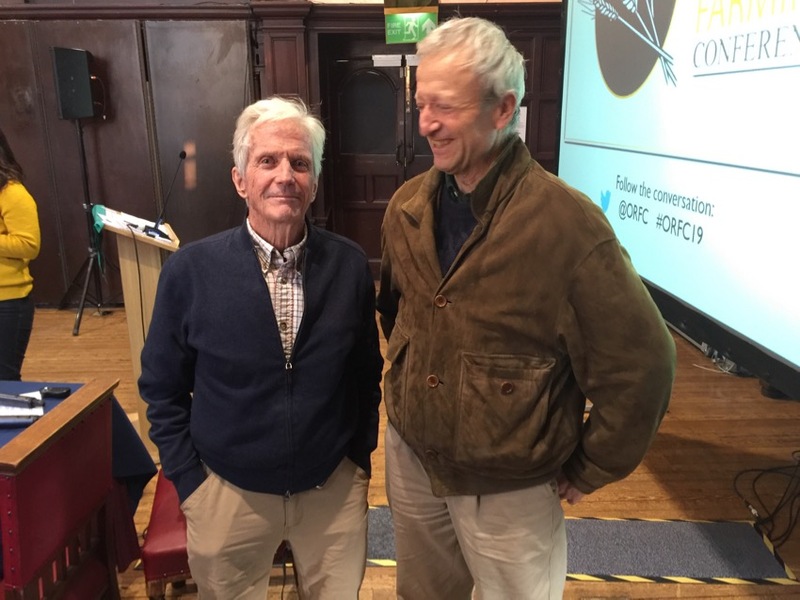 As well as hearing two wonderful talks by Eliot Coleman from Maine USA, I enjoyed chatting with Richard Perkins at the Oxford Real Farming Conference. We are teaming up to offer a 4 day market gardening course at his farm in Sweden. I am really looking forward to the trip and to seeing some of you there. 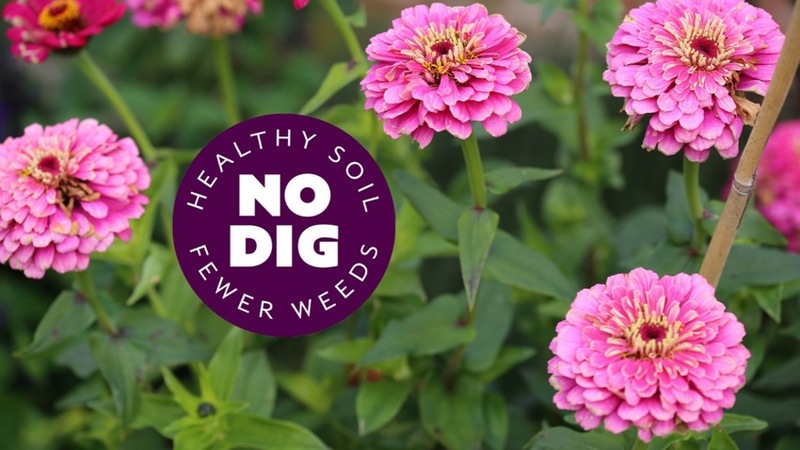 Plus I am staying an extra day to give a no dig course for gardeners on June 29th, also at Ridgedale, which is 3-4 hours from Oslo, Gothenburg and Stockholm. Before that I shall be in Norway to speak at the Stavanger University conference in mid March, along with Elaine Ingham, Joel Salatin and Professor Dag Jørund Lønning, whose second book on soil is being launched at this event. 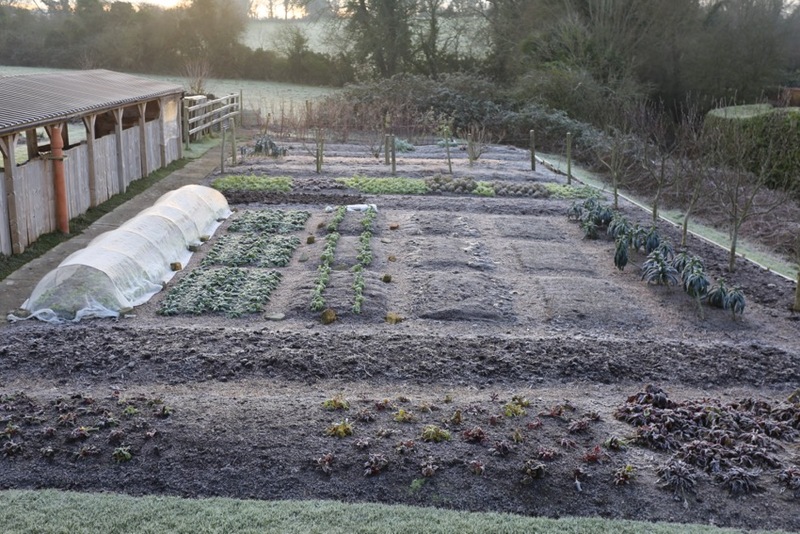 Homeacres courses are sold out on 26th January and 9th February, with three places still on 13th February, just one place on the weekend intensive late February, three on March 9th, and many more from there, do have a browse of the dates. For those in Ireland, I am giving a day course at Ballymaloe Monday 20th May, and at Glebe Gardens 25th May. Also a weekend at Birr Growery 13th-14th April, tbc. Check out the Events page for any talks near you, including near Bristol February 7th, near Southampton 12th, Dorchester 14th, West Dean College Chichester 16th, and London Guardian 17th with Alys Fowler and Hollie Newton. 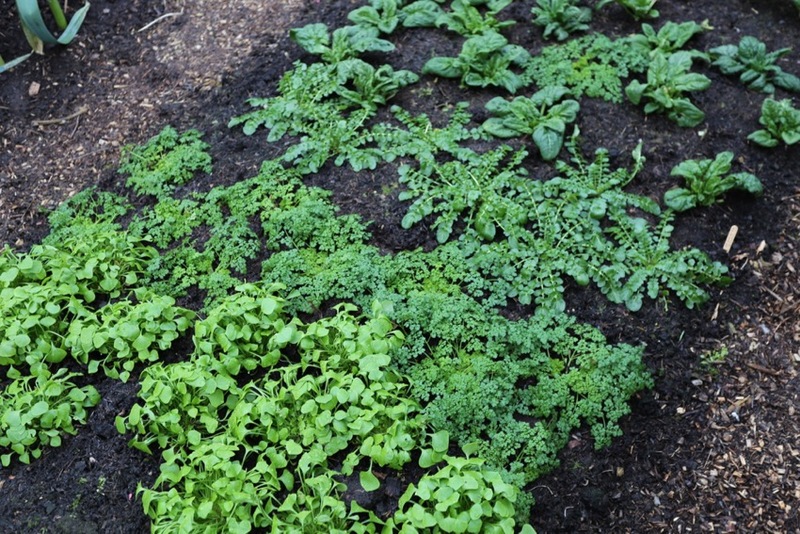 Plenty of gardeners believe that rain washes nutrients out of composts. Yet if this were so, planet Earth would be way less abundant than now, with all that food washed away, which in reality is held in humous/compost on forest floors and grassy fields. My gardens would not work either, because I apply compost as food for soil organisms before the winter. 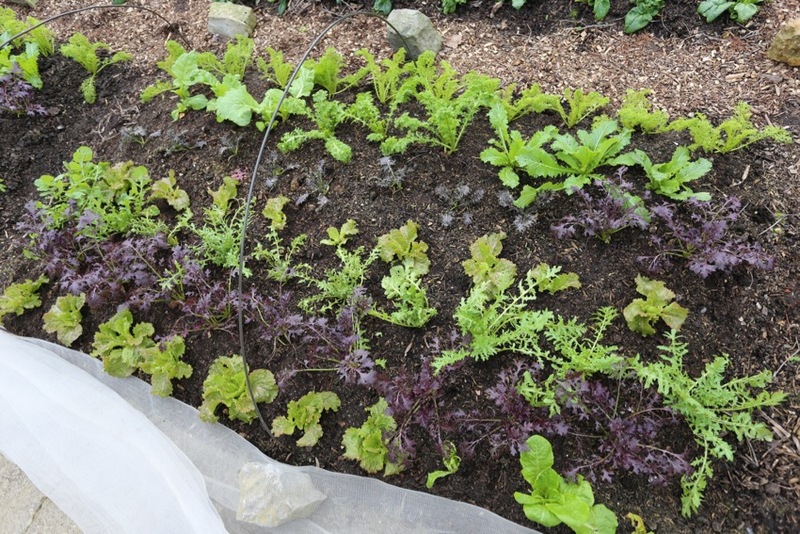 This means beds are ready for planting early in spring, and plant roots love the soft, weathered compost surface. A lot of rain washes through before plants start to grow. Not covering beds with plastic is another job saved, and money too. The only time you may need a polythene cover is to kill rampant weeds, in year one. 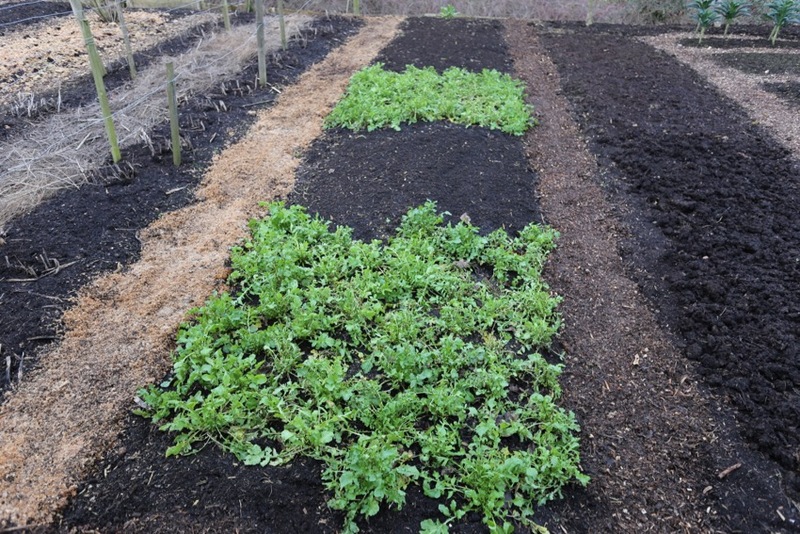 In any mild winter there can be weeds germinating from newly spread compost, and a little hand weeding is worthwhile. The weed roots are easy to pull from such a soft surface, so different to the stickiness of soil. Watch for pests, as birds and rodents grow hungry. I suddenly have a rat(s) in the compost heap, don’t mind as long as they stay in there and keep aerating it! Another job is to buy seeds, use this link for help in choosing varieties. To plan sowings, use my calendar and Diary on offer at £18. The calendar is still good to buy as first sowing dates are not for another month. On a dry day, run a rake lightly through the surface compost to break up any lumps. Keep mulching any unfed soil, including paths. If your paths are wweedy, lay cardboard then small wood or any less perfect compost, to keep the cardboard down and improve the soil. Paths are an important part of your growing space. 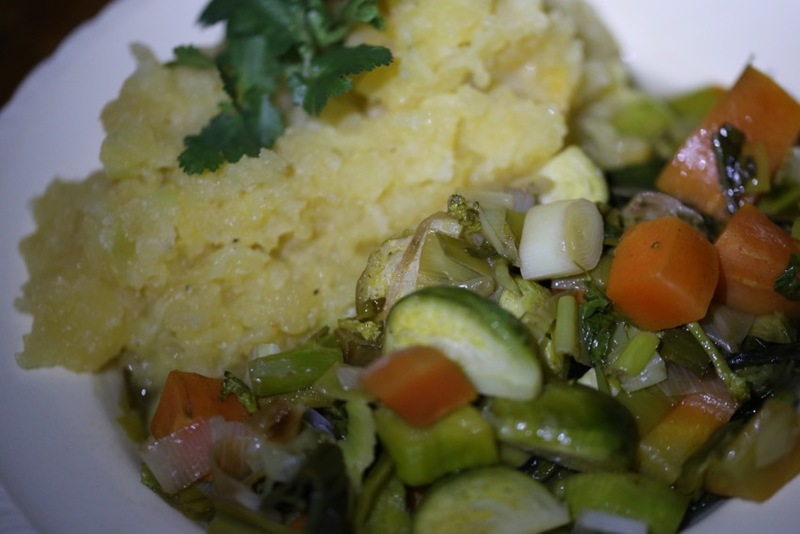 It’s the best part of veg growing, all the lovely healthy food we can eat. We have been enjoying a hugely varied repertoire and value the greens above all. 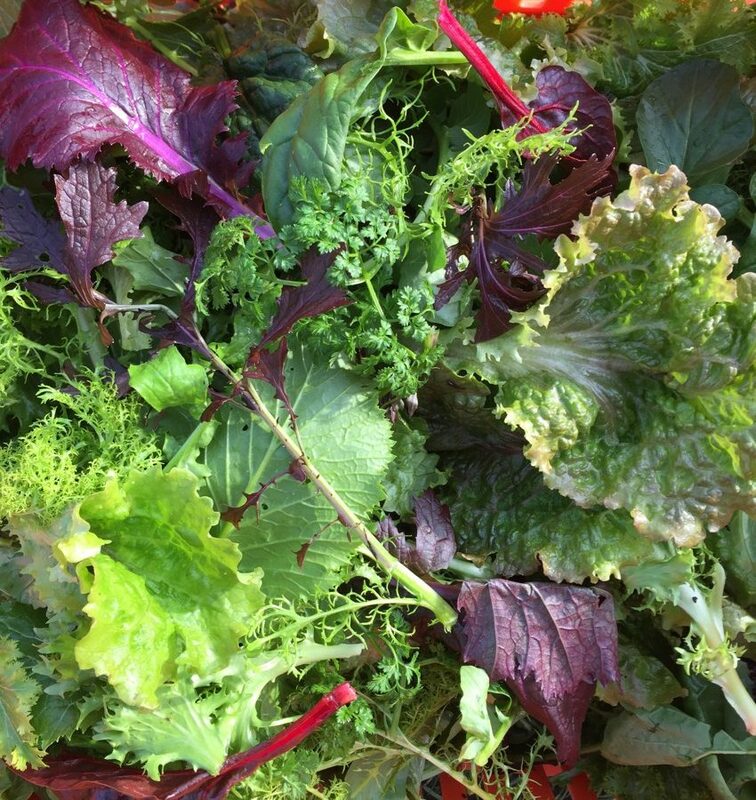 I saw a lovely quote about my Winter Vegetables book from Mary Czarnecka on Facebook, “It’s brilliant, I’ve been self sufficient in winter greens since buying this three years ago”. I sum these up as delicate and rather thin leaves, on sturdy plants. Always I am impressed by how they manage to make new growth, in such dark conditions, just eight hours between sunrise and sunset. 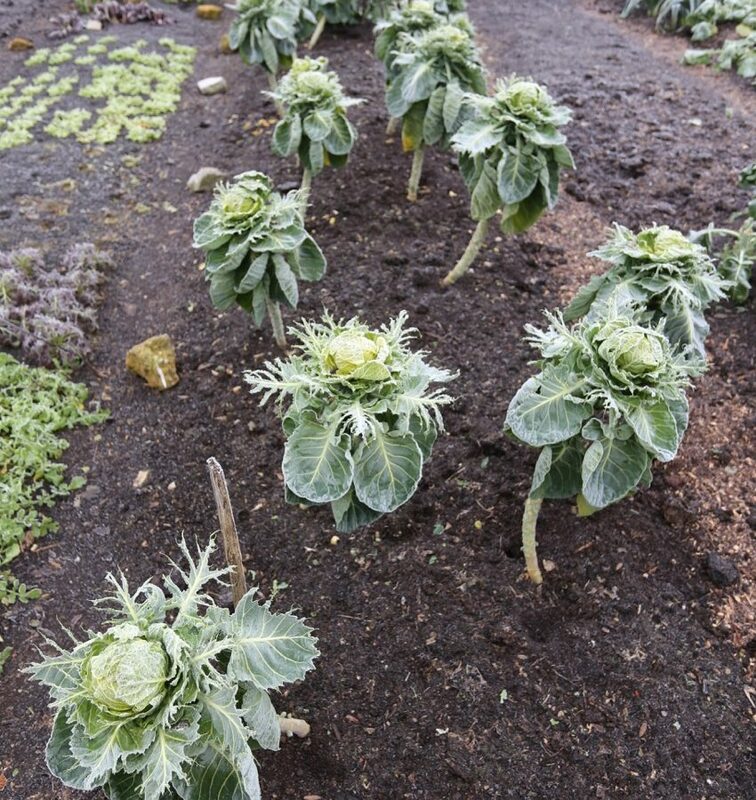 Between mid December and mid January, these plants had just 35 hours of sunshine. I have a friend with land which has been turned over with a tractor year after year simply to keep the growth away and now he is working on it with lots and lots of weeds. He wants to adopt the no dig method, but if it has been previously dug how long would he likely have to contend with weeds using option 1 until weeds don’t come back and he can plant a wider variety of seeds, etc? My answer, James I am sad to hear of soil life being hammered like that. The weeds are a response for sure. However soil life can recover quickly under a decent dose of organic matter on the surface. Soil organisms eat it, procreate, excrete and bring structure and back. I suggest 4in/10cm in this case, it could be old manure, not perfect compost except for the top 1in/3cm for planting into. A big investment initially, but so worthwhile, will repay for years to come and save so much time from fewer weeds, less watering and better drainage. This is my advice about no dig in reply to an (not the) RHS level two teaching, via Instagram’s fakenhamgardener, who sent me this RHS explanation of no dig which she is being taught. She was puzzled and I wrote this to clarify misconceptions about how to start no dig, how to mulch, and what is “compact” soil. Plus to know the difference between fertiliser (often leaches) and compost (mostly doesn’t). • check out the success of no dig at RHS Wisley, Kew Gardens, National Trust Sissinghurst and many more. Two myths I obviously believed busted – first, no need to remove perennial weeds before covering , second, no need to use plastic. I hate plasti and don’t use any more than I have to, in the form of pots and seed trays. As an enthusiastic member of No-Dig Gardening – Undug on Facebook maybe I will pass this on, the removal of perennial weeds is a common bit of advice, I admit to having given it! Now I can try to persuade the limited use of plastic covering, it seems to be creeping in for beds for growing through and I passionately believe we should all be reducing our plastic use as much as possible. How I wish there was a cost effective alternative for seeds. other than the loo roll ad newspaper (who gets a paper one now?) homemade pots solutions. Thanks Charles you are my go to expert for my veg garden, now planning my no-dig cutting garden for flowers for the house. Thanks Lindsay, and best of luck on your reduce plastic mission. I met a guy invented rubber trays for propagation, fingers crossed. What do you think about soil blocks? It seems to be the best alternative, no plastic, no rubber, just soil. Have you tried them? Yes I have used them Martin, though I found it took more time to mix the compost to a sludge then press them out, compared to filling trays. Thye also need fine compost and are not so easy with some peat free types. Hi Martin, yes the paper pot transplanter, it’s for larger growers as an investment in kit, looks fast! I live and am a market farmer in Hokkaido Japan for 25 years. I have never seen any of my fellow market farmers use the paperpot transplanter. One has been sitting on a shelve in our Home center for years now and it looks like it is still the same one from years ago. If we transplant on a large scale, lets say more then 10are, we use a mechanical transplanter. for smaller areas transplant by hand. Hi Charles, seeking path advise please. We’ve sourced a freebie builders size bag of chunky wood shavings (inc tree bark) for our allotment paths; can we put it straight on the paths or do we need to store it until it starts to break down? I recall hearing that too much wood can potentially poison the soil so am obviously keen to avoid this. Many thanks, Andy and Mary Higgins PS great jacket! Mary it depends how much conifer (Slow to decompose) and how chunky! Small is beautiful say 2cm max any way. Best stacked a year first but could be a path mulch as long as paths are clean of weeds, or cardboard first. Spread say 3cm thick. Hello Tris, it’s a work cabin for many uses, and the forum is as the forum is. The site developers say the upheaval to reintegrate it is not worthwhile. Do you find it usable? I notice it’s gone very quiet. Shame re. the forum though it does work, but yes, quieter than usual at this time of year. Best for 2019. Posts seem to come and go on your patch quite regularly. 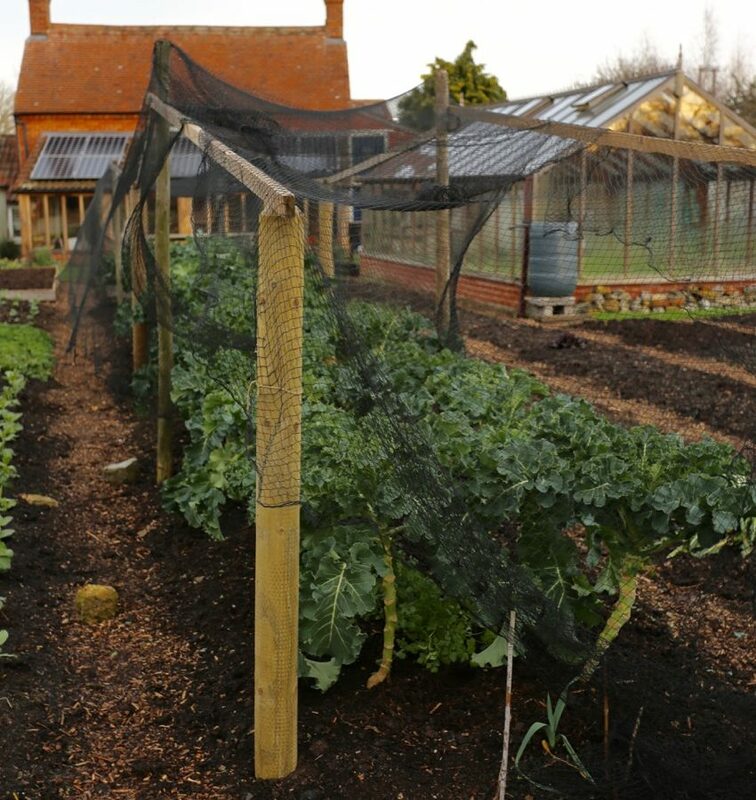 The ones netting the broccoli look quite substantial. Do you have trouble getting them out again? Any tips? How deep do you put for stability? Were I to use that size likely they would become permanent. I am on heavy clay, that doesn’t help. Derek, we use a two handled post rammer. They are not deep, about a foot/30cm, and can be eased out in May. I have used them on clay, no problems. I’m new to gardening, (I’d concrete loving parents 🤭) and just wondered is there a preferred time to start a no dig garden or can I put compost down now and get preparations under way. I have really enjoyed reading your website and watching the YouTube videos, it’s inspired me to turn my grass land to edible growing. Hi Tracy, lovely to hear your comment and yes, the idea time is always now! You will be more ready for spring. Actually you can plant a no dig bed of compost on the day you make it. I am sure you will enjoy it and grow some tasty, nutritious food. I have heavy clay soil with very large flints in the subsoil. When I created my first raised beds I double dug and removed large quantities of flints (some almost one foot long). 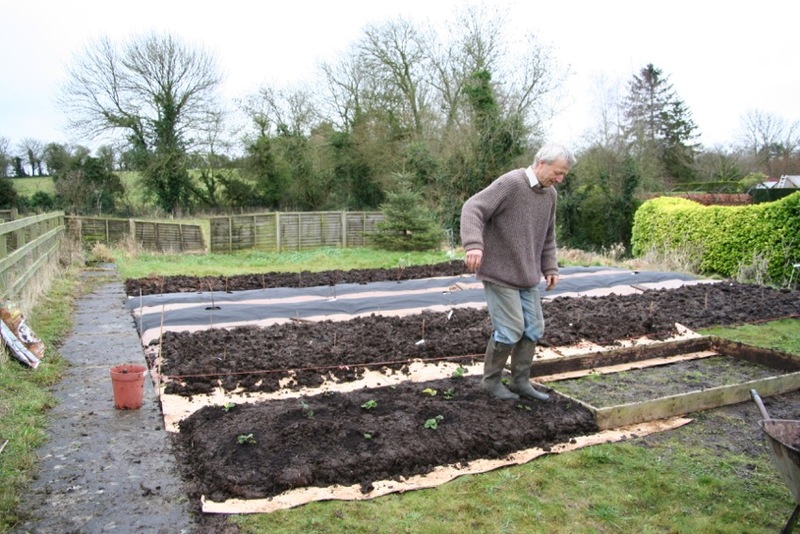 I am hoping to create a couple of new veg beds in another part of the lawn. Should I try to remove the flints by digging first? I would leave them.Just mulch on top. Your soil has good structure all around those flints. It sounds like my Small Garden which has huge slabs still in the soil. This is my first year on my allotment. Never done no dig before, so very much a beginner. I have your calendar but can only see sowing time for onion seeds. I have bought sets, which arrived a couple of weeks ago. Can I plant them now? Worried about them sprouting or going soft if I keep them till March. 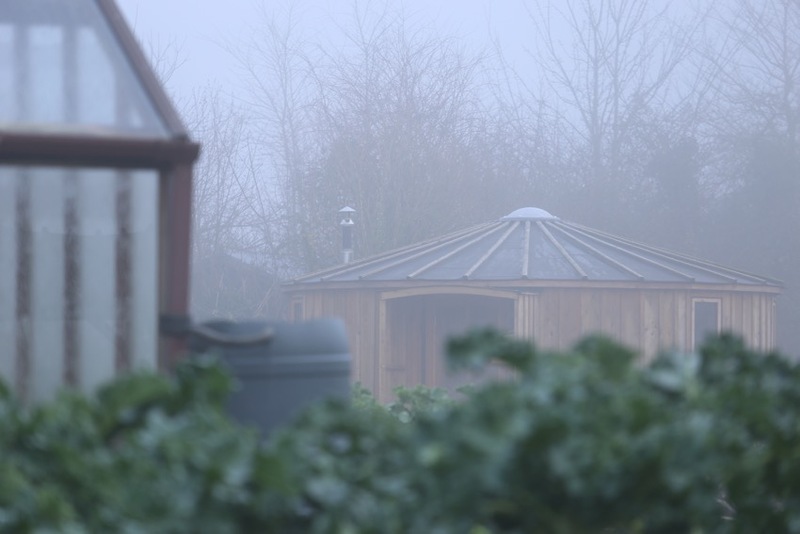 (which seems to be the time the catalogue recommended) No greenhouse only a shed to store. Thank you. 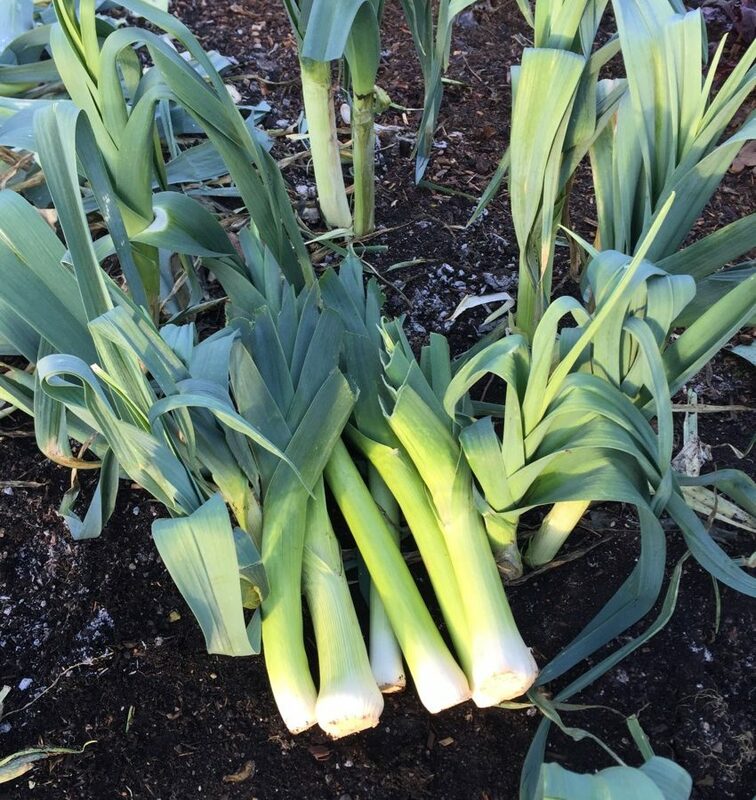 Thanks for this Ruth, reminds me I somehow missed onion sets which I recommend from mid March. You could plant them now but they are more likely to bolt, especially red ones. You can keep them in your house, less moulds from dry air, and they can be planted when sprouting. very interested in your talk in Birr (13 April) mentioned here but cant find it on events page. Are you still coming to Ireland? Nearly finished two new beds with wooden sides, straight on lawn and filled with green waste, spent mushroom compost, rotted manure (about 6 inches deep) and topped up with about 2 inches of my garden compost sifted to get rid of large twigs. I want to use them this year. Should I walk on them to firm them? 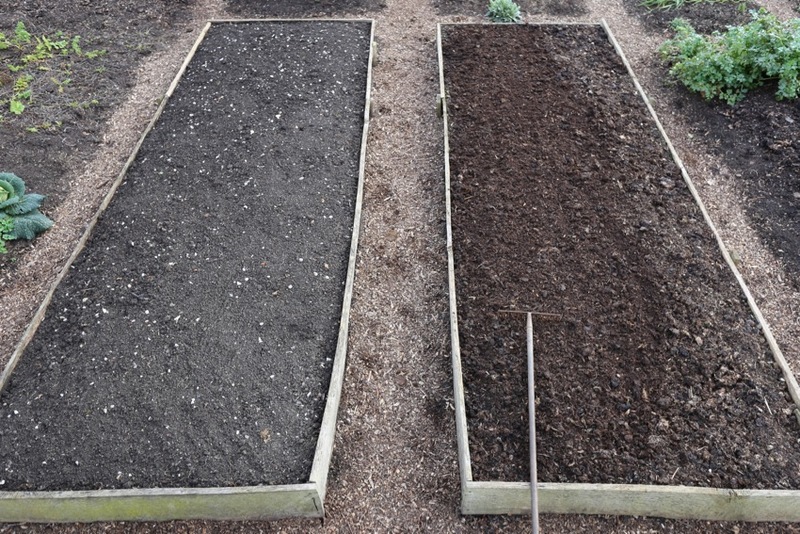 I keep wondering, with this No Dig method, at some point you will need to remove some of the compost/soil from the beds as otherwise it just keeps piling up increasing the height of it? I have really learned a lot watching your videos and reading on your website. 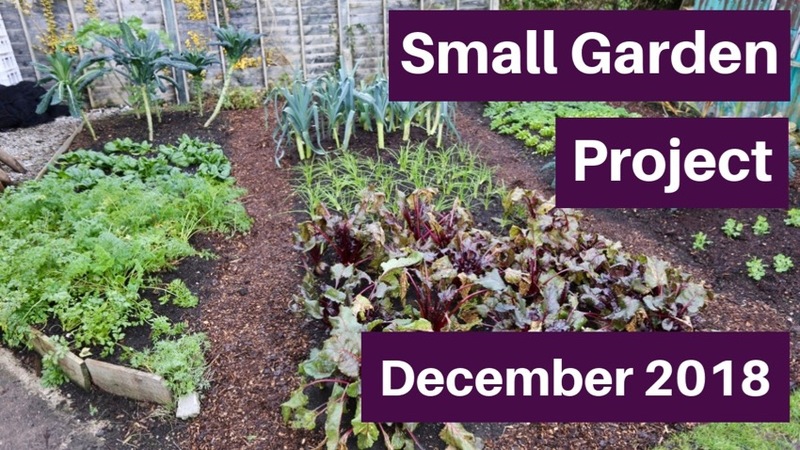 We are going to do no dig vegetable and flower gardens for the first time! I never gave any thought to what is in my soil and how to care for it! Thank you for opening my eyes! So from what I understand we can put cardboard right on top of the grass, pile on compost now and start planting when the weather cooperates? I am so eager to get to gardening. I am using soil blocks this year and really like it. It saves so much space for my small greenhouse. Thank you so much for all you share! Sounds great Heidi and lovely you are feeling excited. Yes simply mulch the grass/weeds as you say.